Anyway, here they are, and I also put in the photo of not the same quality in of the first bus I saw in Ipswich this year. P.S: As I was walking to the bus stop, a Westside Buslines Scania K230UB* with Custom Coaches CB60 Evo II bodywork on a route 503 to Bundamba caught me off guard, so I didn't get a photo of it. 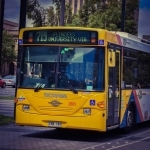 *Checked Bus Queensland - Ipswich on Australian Bus Fleet Lists to see the chassis type as I knew it was a Scania but was unsure of the actual chassis model. Raceview Street at Rockman Drive Bus Stop Sign with Westside 39 approaching in the background on a route 503 to Riverlink. Am adding this because I think it's a nice little touch - TRANSLink is engraved AND coloured on into the metal seat at the bus stop. Impressive! You can certainly tell that road has been freshly resurfaced. What camera/phone are you using to take your shots? Overall, nice shots. I like that feature in the bus seat too, not something you see here either. Keep it up! Can already see the improvement, Sydney_Buses_CB60, keep it up. Haha No. we finally have nice weather today. You'll be glad to know that the forecast 40 for the weekend is only in the high 30s now though. Lt. Commander Data wrote: Haha No. we finally have nice weather today. You'll be glad to know that the forecast 40 for the weekend is only in the high 30s now though. Hawkeye wrote: What camera/phone are you using to take your shots? Tomorrow I'm going to go to Ipswich Bell Street, which is the big Bus Interchange in Ipswich, apart from Riverlink & the Ipswich Hospital, and I'm going to take photos of the buses there for a bit and because it's literally directly above Ipswich Train Station, so I'm going to get on the train from there to either Milton or Roma Street before going to Suncorp Stadium, or, as I think it's nicknamed, 'Sunburnt Stadium' ( ) to watch the Soccer, then I might be able to get some photos of Brisbane Transport Buses. I'm not sure when, but I'm going to try and get back on some buses from Logan and get some photos. If you're planning on purchasing a professional camera, definitely make sure you shop around to find the cheapest one. I've saved around $500 on my camera and lens by simplify shopping around and waiting for sales. Read lots of reviews as well to make sure you're getting one that will suit your needs, remember your photogrpahy may branch out over time. I would also recommended an SLR camera, most are these days, but just check to make sure. I started on an Olympus VG-160, which was ok, but not that good. I then started using my parents' old Kodak DX7590 Zoom, which was a big improvement on quality but had a very slow shutter and zoomed slow as well. Then, about 7 months ago, I purchased my very own DSLR camera, a Nikon D3300. It's 100 times better than what I was using before, and my photo quality improved yet again. And just yesterday, my Christmas present finally arrived, a Tamron 18-270mm F/3.5-6.3 Di II VC PZD Lens. I haven't used it much yet, but I am predicting another increase in photo quality from the few I've taken. So always remember that over time, you can improve your equipment, but it's always the technique that will make good photos. You could have the best camera and lens available on the market, but if you have no technique you'd still have bad photos. Technique comes with practice, so the more you're out and about taking photos, the better they'll get. Like Data said - when looking to buy a camera, look around. Don't just go to one place and have your heart set on that one. You never know, you could have missed a great deal elsewhere.. Anyhow, best of luck! Hope to see many of your shots in the future, and to see your skills and techniques build into something great overtime..
To be precise the bus you saw today was fleet #88 Oh and the last pic is #33 not #32. Always good to see Ipswich pics on here.